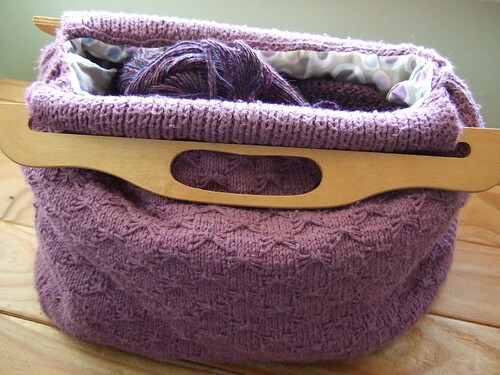 I designed this knitting bag in 2002, and it is still going strong! The pattern was available for a while on another website, and I have just added it to this blog under the free patterns category along with the Ribbed Slotted Scarf pattern. I bought the handles in a little craft shop in Brighton, which has now closed down, but similar handles are available here and here. I thought I would post another photo of the laceweight crochet shawl. 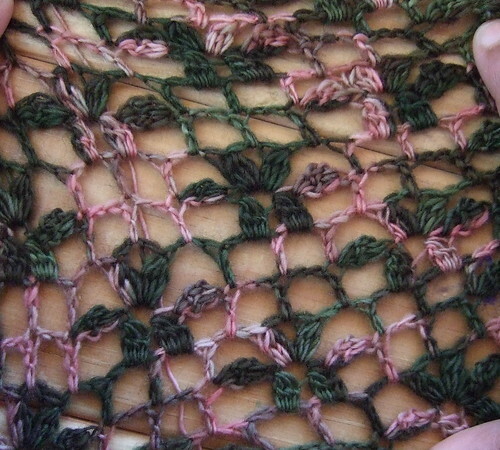 This photo shows the stitches stretched out, which is hopefully what it will look like when it is blocked. I think it looks so much prettier like this and can’t wait to see what the finished blocked shawl will look like. That’s a wonderful knitting bag! Thank you for sharing the pattern. HI, What a lovely bag. I have been gifetted with such handles and am looking for bag patterns. I have enough handles to make a bag in each craft.These handles were very popular some 40 years ago here in India. I was looking at your blog because I saw your top-down crochet cardigan on Ravelry. I am definitely going to make it. And I love the shawl pattern in the lace weight. What size hook are you using? I love this. Color is very sweet and also design is so cute. I like your other works too. You are very good color choicer!